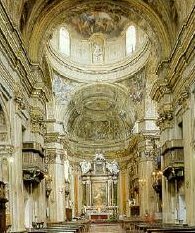 The Church of San Filippo Neri is the most important and the only authentic Baroque building in town. The Vignola-style facade dates back to 1665 and was designed by the Roman architect Paolo Marucelli, while the church itself was built between 1627 and 1634. With its barrel vaulted single nave and lateral chapels, the interior is richly decorated with frescoes of a variety of painters who worked on them between the 17th and the 18th century. The Immaculate Conception above the main altar is by Pietro da Cortona and was painted in 1662. Follow Corso Vannucci and then Via Priori.